Yup. It's pink. But it's kinda cool, don't you think? Not perhaps cool enough for me to do an all over pink job on my own hair, but it's cool on Leilani. *Sigh* And as I sit here thinking about what I'm going to type next, I've spotted three areas where I could should have added darker pink, to define how the hair is sitting. Why can I not see these things when I am looking for them?! Ooooh, all this plotting, I nearly forgot! New Challenge over at Little Miss Muffet Stamps... Funky Hair. See you there! I love the pink hair! That is a very cute image! I love the background paper, it matches your doodling! OH!! I love her funky hair!! So fun!! Her pink hair stands out even more with this otherwise black and white design, I really like that. The black sequins and white pearls are nice embellies, not too overwhelming, and I think the squared background looks really cool. Oh my goodness, Faye! She is stunnning! Love the pink hair against the black and white card... she just pops! She's gorgeous, love her pink hair. I luv the pink hair. Luv Muver..
Cunning plan hey sounds like a plot might be on the cards . She's gorgeous and definitely suits pink hair. As always your colouring is amazing and I love the detailing too. Fantastic colouring Faye and I love her pink hair...gorgeous card. 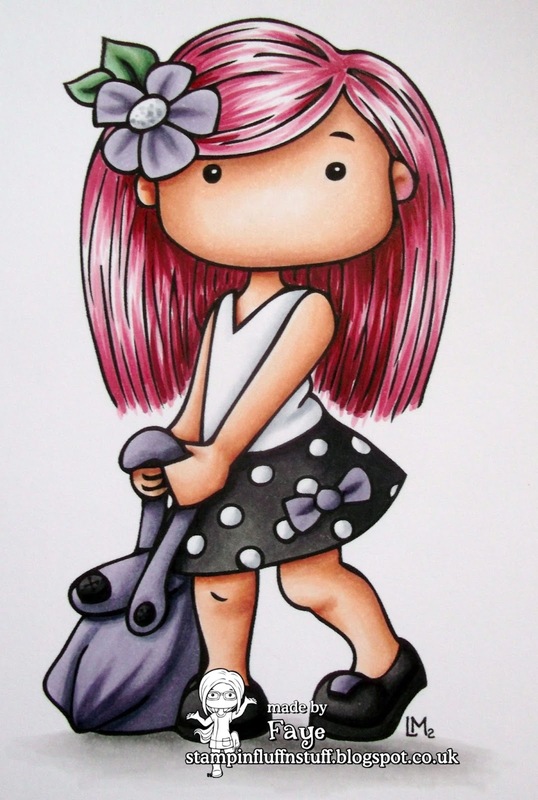 Fabbie card - Loving her pink hair which doesn't look to me like it needs any more definition! Of course, pink is my FAV colour (as you may or may not have picked up... hehe). Can't wait to hear more of the cunning plan re VUH! He he he, I shouldn't laugh but it sounds like you are as harsh on yourself with regard to your colouring as I am! It's safe to say that the pink hair is awesome! Now, does your plan for VUH's clothing repair involve patching them with craft stash?! If not, I may have just got myself in trouble for suggesting that - oops! ooooooh! I do love this little gal and your fab colouring. Perfection!